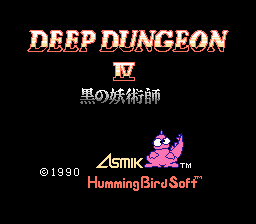 Way back before Dragoon-X was involved in translating Deep Dungeon IV, the translation project was originally started by Off Course Translations, consisting of Dustin Hubbard (now going by Hubz). The ROM he used to hack the game had one of those “dirty” headers that you used to see all the time back in the day, and the same ROM was used throughout the project. This means that any ROM patched with any of Off Course’s or Dragoon-X’s patches will have a “dirty” header and will not run in most modern emulators. This is an addendum patch, and is intended to be patched on top of a Deep Dungeon IV ROM with a bad header. In the case of Off Course’s and Dragoon-X’s translations, use this patch AFTER using the translation patch. This new patch will now restore the entire header, rather than just a section, so it can be used on top of any Deep Dungeon IV ROM to restore the header completely to its intended state. This includes the original Japanese ROM, as well as KingMike’s translation from 2011. It shouldn’t be necessary in those cases, but here it is if you want.